When Rebecca isn't creating in the kitchen, she's going mad in the garden! A total love for beautiful flowers has led us to start offering flowers from our spray-free home garden for you to decorate your own creations. Available in either whole flowers or petal confetti in a mixture of colours and varieties, depending on the season. Please contact us if you have a specific colour theme and we will try to create a custom colour selection for you. They come in 250ml containers. Most varieties will last for up to a week in the fridge. To use either use the whole flowers for decoration, or pull off the petals for complete edibility in cooking and desserts. We also grow a number of non-toxic flowers suitable for decorating cakes and culinary creations. Please contact us and we'll see how we can help! 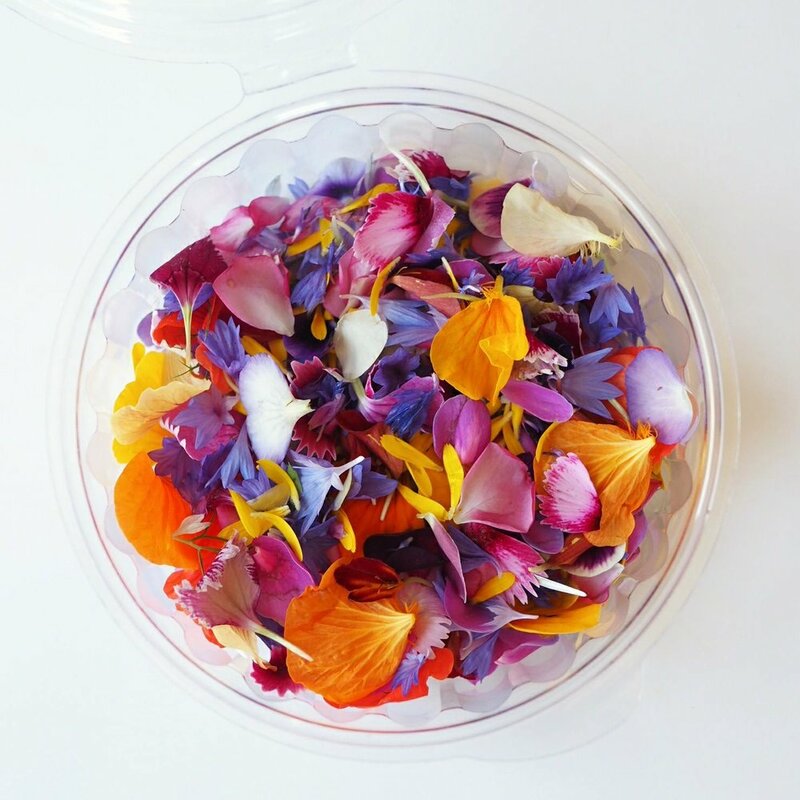 To prepare non-edible flowers: cut stems to length and wrap in floral tape. You can also wrap a toothpick to the stem to give extra strength if needed. It is not recommended to insert wire into a cake. If you use wire make sure it is wrapped well. For extra safety insert the wrapped flower into a drinking straw before inserting into the cake.